Ready to be a showstopper in this fabulous colorful knit! 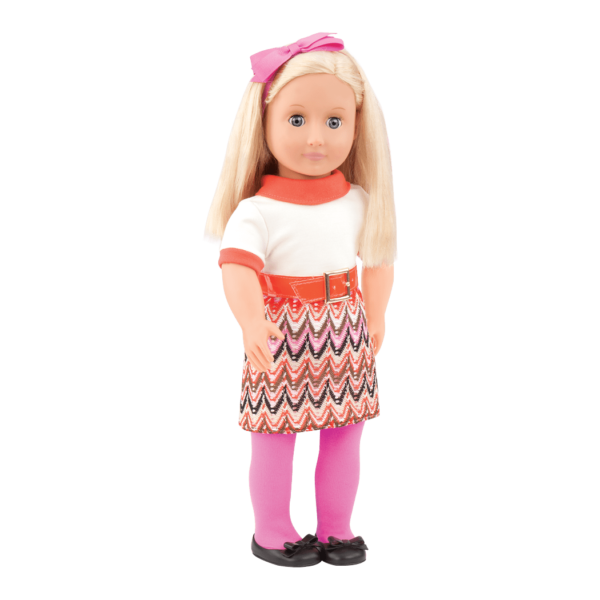 Your dolls will be colorful and sweet in the Our Generation Neat-O Knit Retro Outfit for 18-inch dolls! These vintage-inspired doll clothes are sure to draw attention with their fun patterns and a rainbow of fun colors! Ready to make the scene in this Neat-O Knit! Start with the short-sleeved knit dress for a shot of 1960’s style. With a white top, bright orange collar and sleeve cuffs, a wide orange belt, and a multicolor knit skirt, this dress is ready for a party! 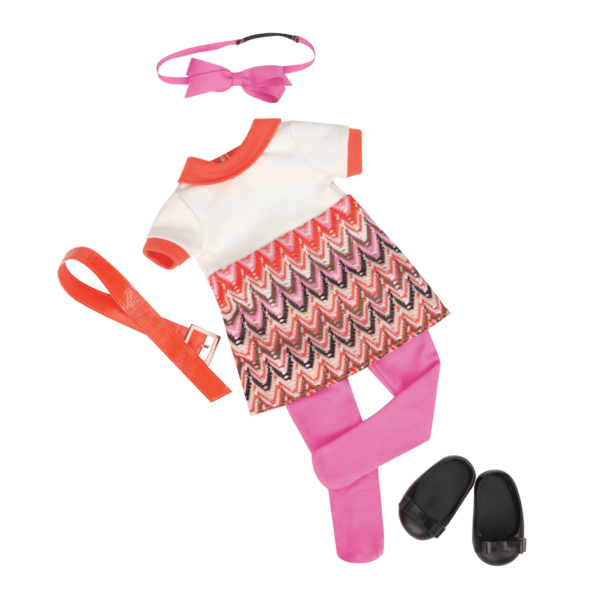 Brighten up the look even more with the bright pink tights and hair ribbon. 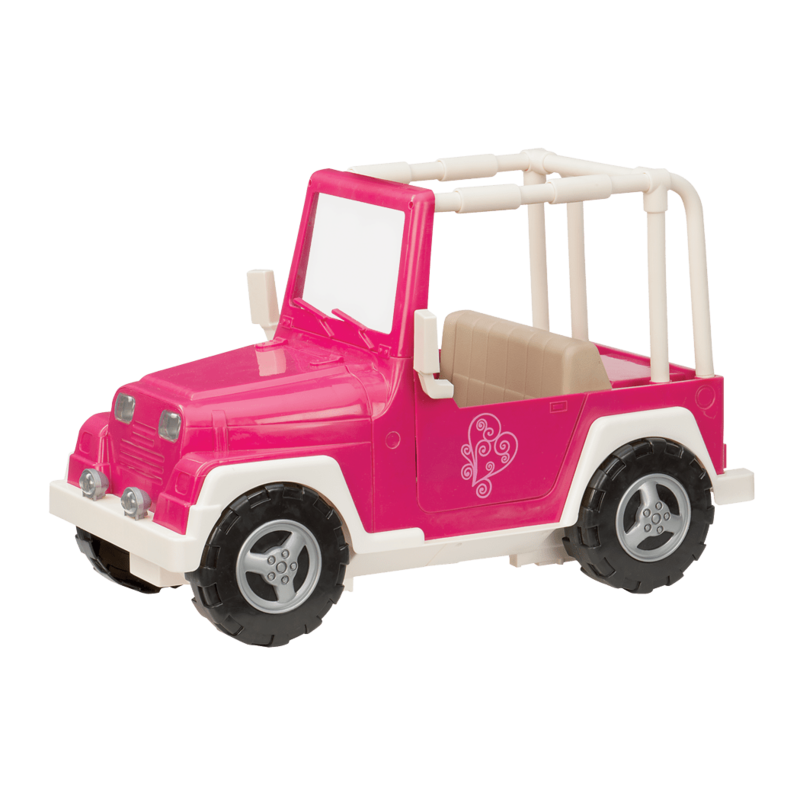 Contrasting black shoes set off the bright colors and will have your dolls stepping in style. Use these doll clothes together for a retro look, or mix and match the pieces of the outfit with other doll clothes for endless style options! Have you met Anya, the doll modelling the Neat-O Knit outfit? Anya is a graceful and sweet doll who is part of the Our Generation Jewelry Doll collection! She has pierced ears that can really wear earrings! Dressing up your dolls is so much fun, why stop at clothing? 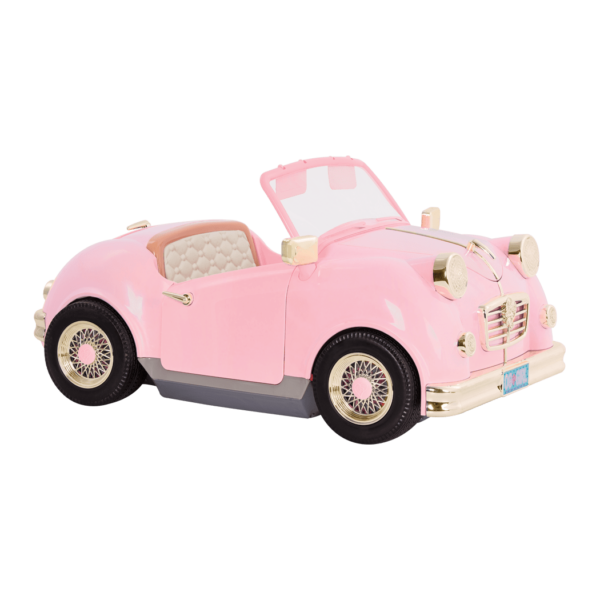 There are lots of great hair accessories for your dolls, like the Attached at the Clip hair accessory set for dolls that can be shared with kids, too! Collecting doll clothes is so much fun, and it’s helpful to have a great closet to store them in. Keep your Our Generation doll clothes neat and tidy in the Wooden Wardrobe, a sturdy closet for dolls with a mirror, a stool, and lots of space for your doll’s outfits and accessories!